We let our fireballs do the talking when we descend upon a tribe of barbarians at Beorunna’s Well. Note: recording was split due to technically difficulties, and YouTube no longer has Video Editing. We were almost within shouting distance when I noticed the barbarian shaman wasn’t just waving her arms – she was casting a spell. Before I could pull up on the hippogriff I saw blinding light all around me. I waved my hands reflexively, nearly losing my grip on the flying mount. My eyes stung but the lights quickly evaporated. My hippogriff mount merely shook its bird-like head a few times. I glanced over at T.I.M. who nodded back at me reassuringly, followed by some obvious gestures. Those barbarians were clearly not willing to talk. We quickly flew down to the ground, but before we could close in on the barbarians, a bright beacon of light glowed in the night sky like a red sun. I glanced up and just made out Bryseis atop her hippogriff, aglow by the burgeoning ball of fire held between her hands, a wild grin on her face. I could hear her cackling even from over 100 feet away. It was all I could do watch in stunned silence as the Fireball dropped like a rock onto the barbarian horde in front us. I’ll never forget the shouts and screams, followed by the smell of vaporized snow and melting flesh. Through the haze I saw more than half of the tribe become enveloped in fire, reduced to puddles of ash and bone. The shaman’s screams echoed throughout the sunken chamber. The cackling stopped suddenly. I looked back up to see Bryseis’ hippogriff, a shadowy flapping figure in the night sky, but no Bryseis. An object rolled off the beast’s back and began plummeting toward the ground. It was a potted plant. More Ostorian relic-hunting this week as we travel north to Beorunna’s Well, site of a Storm Giant burial. 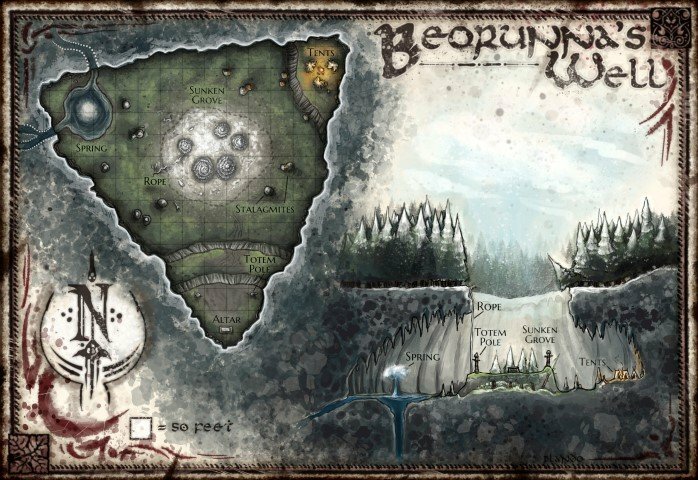 Beorunna’s Well offered a unique three dimensional battlefield and a variety of enemies – all of whom were hilariously susceptible to some well-placed Fireballs. The journey from the Grandfather Tree to Beorunna’s Well was thankfully uneventful. We did get a chance to stop in Hawk’s Nest and have a brief chat with the dude who gave us our hippogriffs. He warned us of large aerial predators in the Druarwood, our next destination. As we flew northeast Halfred’s Primeval Awareness sensed a trio of griffins hunting in the air several miles away. We were able to easily skirt around them. That Unearthed Arcana Ranger ability is crazy powerful, particularly in “Storm King’s Thunder” as we travel around so much. Halfred has monstrosities and giants as Favored Enemies, which covers a large variety of enemy creatures. It would come in handy again as we approached Beorunna’s Well. The Well was a large, triangular hole in the middle of the forest. About 200 feet down was our destination. The tree corners of the sunken area held a natural spring, a collection of tents, and an altar, with a snowy area in the middle. We could easily spot a group of barbarians huddled around a campfire near the tents, and we debated our options. Halfred’s Primeval Awareness clued us into a hidden manticore who was bathing in the spring. We initially planned on trying to lure the manticore into the barbarians, but after some discussion realized there was a good chance the beast was actually allied with the tribe. We had the element of surprise on our side but we’ve proven again and again that we are absolutely terrible at both planning and executing tactical plans. The best thing we could come up with was using our height and distance to draw the manticore up to us, away from the barbarians, splitting the enemy forces. Even with disadvantage due to long distance Halfred is still a champ with his short bow, easily shooting the monstrous lion/bat/scorpion creature as it hurled its way toward us. Then Bryseis unleashed a Fireball. She rolled 36 damage on an 8d6, and the manticore failed the save. 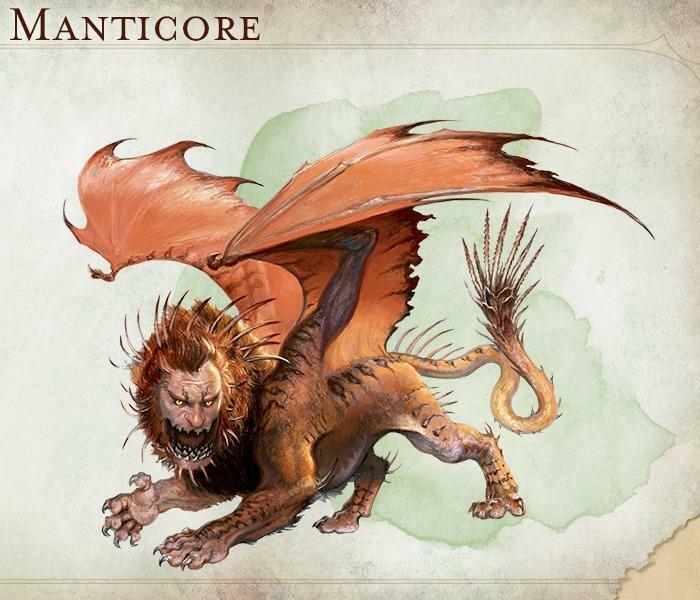 Using our Massive Damage house rules (adopted from the DMG) the manticore was left stunned – which meant it began rapidly falling out of the sky! While it plummeted Halfred, T.I.M., and Korinn all whipped out their bows and crossbows to fire at it, hitting it despite the distance disadvantage, and killing it before it could either right itself or crash into the ground. Ha! A barbarian shaman rose out of the snowy ground in the middle as the barbarians gathered around, looking up at us. These barbarians decorated themselves in war paint and bones which didn’t seem super friendly, and we had probably just killed their sacred beast or totem animal. Despite that I still felt that Kazin needed to give diplomacy a try (I have mind powers damn it). We ended up splitting the party again (heh) as Kazin and T.I.M. flew down via hippogriffs to try and communicate while the others watched our backs. As soon as we got within about 50 feet, the shaman unleashed a Hypnotic Pattern spell on T.I.M and Kazin. This could’ve gone very badly, as rendering us incapacitated while flying would’ve resulted in a painful fall. Amazingly both of us and our two hippogriffs all made the saving throw (T.I.M. had to use Inspiration). Roll for initiative! We rolled poorly on initiative, so T.I.M. and I could only watch while our airborne allies arrived. Bryseis flew over and unleashed another Fireball – this one using a fourth level spell slot, and hitting every single barbarian (10 enemies total). She used her Empowered Spell metamagic to squeeze out even more damage, killing the weaker tribal warriors without them even needing to roll a saving throw! Most of the rest failed the saving throw. The shaman melted, leaving only a few badly injured berserkers. With great power comes great wild magic surges. This is a fun way the DM can curb our cackling tiefling sorcereress. She rolled a 41 on the d100. Bryseis was temporarily transformed into a potted plant for a turn! This was, hilariously, the worst possible time to become a potted plant. She slipped right off her hippogriff and fell 80 feet to the ground below. 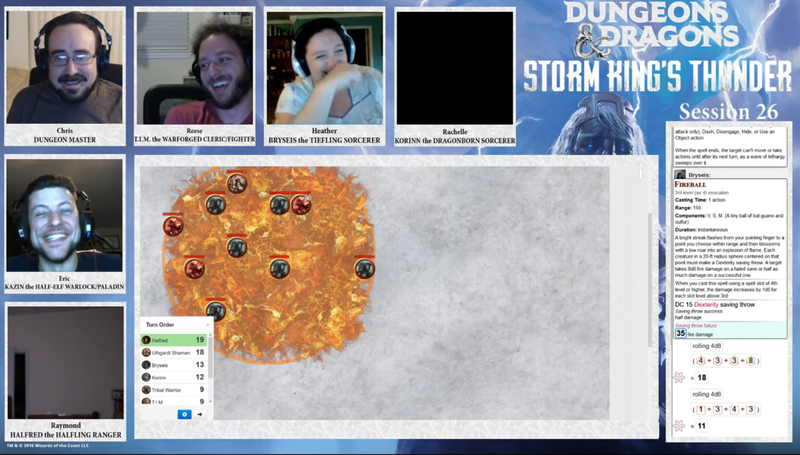 She had to roll 8d6 for falling damage. Miraculously she rolled really low, resulting in only 22 damage. I’m not sure how the plant transformation works. With things like Polymorph you gain additional hit points that are erased when you get hit, and you take any of the leftover damage to your true form. But there’s not exactly any stats for a potted plant. We also forgot to apply the plant’s damage vulnerability. Either way, Bryseis actually survived the fall, leaving her ignominiously sprawled on the floor next to T.I.M. and Kazin. From there the rest of us were easily able to fly over and cut down the last few injured berserkers. Fireballs for the win, though all credit to Halfred’s incredibly useful (almost game-breaking) Primeval Awareness for spotting the manticore in the first place. We opted to explore the altar area next, which contained a giant 30-ft stone altar covered in both recent Uthgardt barbarian markings as well as ancient Ostorian runes and carvings. The altar was actually a big stone container with a moveable lid, though it still took us several rounds of STR checks to move a giant damn stone slab. As we moved it the runes began to glow and something stirred within. It bashed at the lid until the lid was wrenched off. A half-decayed Storm Giant arose from the coffin, and looked none to pleased at having its rest disturbed. Looks like we’ve got one more battle in Beorunna’s Well before we can claim our prize, but it’ll have to wait until next week.